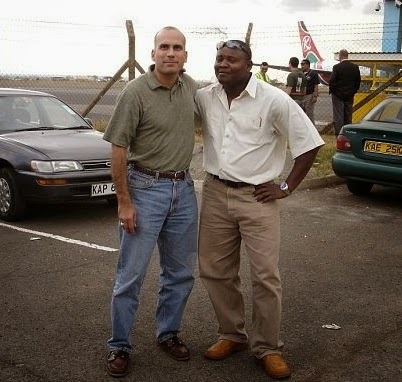 Antony and I on my last day in Nairobi. It's hard to imagine living in absolute poverty. I encounter the relative poor everyday. It's not uncommon to see overweight homeless people walking the streets of America. In developing countries, the poorest of the poor are skinny. When I lived in East Africa I could usually figure out who was the local village chief since he was the least skinny guy. Absolute poverty didn't hit me until I lived in Nairobi. My predecessor told me it was customary for us to pay for meals for our drivers. My driver, Antony, took me to a gas station with fast food restaurants for dinner. He had chicken and rice and I had a Margherita pizza. Each of our dinners was the equivalent of $4. We sat outside as I listen to him tell me about Kenya. After I finished eating I went back inside and bought a Nestle Drumstick. I was surprised it cost as much as my dinner. Pizza, chicken, and rice are inexpensive since their key ingredients are grown and processed locally. But, food that's imported, like name brand ice cream, is pricy. When I sat back down at our table I asked Antony how much he thought my ice cream cost. His guess was about $1.50. I'll never forget his response when I showed him my receipt. He casually tapped on the total, at the bottom of the receipt, and said, "That is more money than I make in a day." More money than I make in a day?!? Those words have haunted me ever since he spoke them. Living on three dollars a day. Amazing.